On Christmas Eve, 1968, the crew of Apollo 8 made history when they became the first humans to travel to the vicinity of the moon. At the start of Apollo 8's third orbit of the moon, spacecraft commander Frank Borman called to mission control in Houston to see if Rod Rose was there. Rose was expecting the call, because he and Borman were friends and neighbours who lived near the control centre. At the local Episcopal Church, St. Christopher's, both were members of the vestry, the group of lay advisors who helped run the church. Two weeks before Apollo 8 left for the moon, Borman found out that he was on the duty list as a lay reader for the Christmas Eve communion at St. Christopher's. Knowing that he was scheduled to be circling the moon at that time, Borman got agreement from the minister, Jim Buckner, that he could deliver his reading from lunar orbit for recording and later playback at the service with Rose's help. Rose selected for Borman's reading the Prayer For Vision, Faith and Work by G.F. Weld from "Prayers for the Church Service League," published by the Diocese of Massachusetts, and gave a copy of the prayer to Borman. "We decided to call it experiment P 1, and Frank agreed to give me one lunar orbit notice before he read the prayer so all the recording could be finalized," Rose recalled. A few minutes after Borman's call to Rose from Apollo 8, capsule communicator Mike Collins said, "Rod Rose is sitting up in the viewing room. He can hear what you say." "I wonder if he is ready for experiment P1?" Borman asked. "He says thumbs up on P1," Collins replied. "Rod and I got together and I was going to record - say a little prayer for our church service tonight," Borman said. When Collins gave the go-ahead, Apollo 8's commander continued, "Okay. This is to Rod Rose and people at St. Christopher's, actually to people everywhere. "Give us, O God, the vision which can see Thy love in the world in spite of human failure. Give us the faith, the trust, the goodness in spite of all of our ignorance and weakness. Give us the knowledge that we may continue to pray with understanding hearts, and show us what each of us can do to set forth the day of universal peace. Amen." "I was supposed to lay read tonight and I couldn't quite make it," Borman concluded. "Roger, I think they understand," Collins said. This was the first prayer broadcast from space. That evening, the crew of Apollo 8, Bill Anders, Jim Lovell, and finally Borman read the first 10 verses of Genesis back to Earth as the grey, battered surface at lunar sunset appeared on television pictures they also sent back. Rose went to St. Christopher's with tapes of the prayer that Borman had recorded that morning and the Genesis reading, and both were played at the service. Although unknown to the public, Rose was well known to the astronauts and the managers of the Apollo program because he played a key role in organizing the flights. Rose, one of the unsung heroes of the Apollo program, passed away January 8 in Houston at the age of 86 after a long illness. While most people who worked in Apollo were American, Rose was a prominent member of a small but important group of British and Canadian engineers who helped NASA's early human space programs after they lost their jobs when the Canadian government cancelled a major aircraft program. This group and their work at NASA was the topic of my first book, Arrows to the Moon: Avro's Engineers and the Space Race. Rodney George Rose was born August 10, 1927, in Huntingdon, England. As a student in wartime and postwar England, Rose had attended the Manchester College of Technology while serving a five-year apprenticeship at A.V. Roe in Manchester. 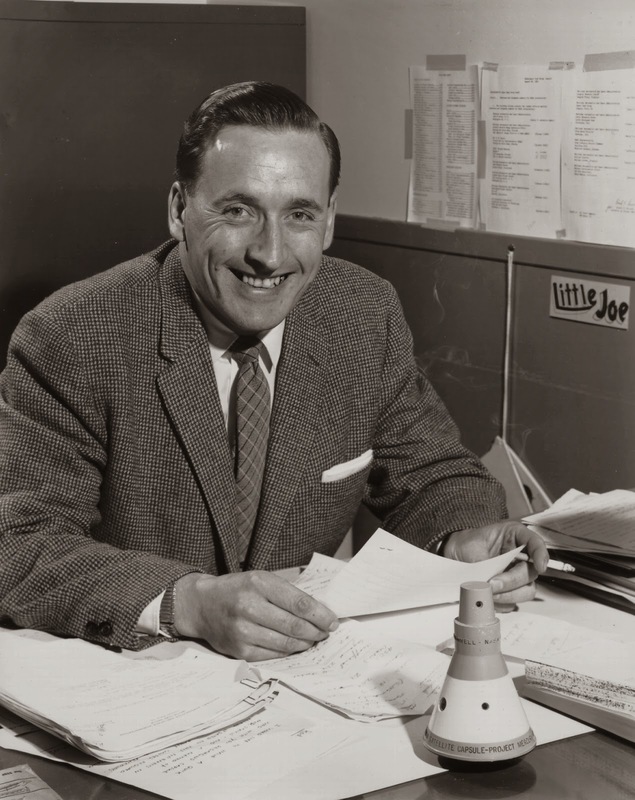 Upon graduating from the college and completing his apprenticeship, Rose won a scholarship to the newly established College of Aeronautics at Cranfield, which he attended from 1949 to 1951. He then went to Supermarine, then famous as the home of the Spitfire of Battle of Britain fame, where he worked on aircraft performance, loads and engine performance. In 1956, Rose had decided that he had gone as far as he could at Supermarine, and he was frustrated by the state of the British aircraft industry. After reading in the paper about Avro Canada, which was building jet interceptors for the Canadian government at their plant near Toronto, Rose crossed the Atlantic early in 1957 with his wife Leila and their two sons. During his 23 months at Avro Canada, he worked as an aerodynamicist on the CF-100 and the CF-105 Avro Arrow jet interceptors, and also in flight test and in advanced design. The CF-100 went out of production in 1958, and on February 20, 1959, the Canadian government cancelled the Arrow program, leading to the closure of Avro Canada and the loss of employment for thousands of engineers and skilled workers. At that time, the National Aeronautics and Space Administration was in its early months of existence and was looking for talent. Officials from NASA's Space Task Group, which grew into the Johnson Space Center, hired 31 of the top engineers from Avro, including Rose. In the Mercury program that flew America's first astronauts, Rose worked as project engineer on the Little Joe rocket that was used to test the Mercury spacecraft before it was launched atop larger rockets into space. Rose also worked on recovery systems for both the Mercury and Gemini spacecraft. During the early 1960s, Rose represented the Flight Operations Directorate in meetings with Apollo spacecraft contractor North American Aviation, and when the Gemini program began flying, he became a key member of the flight operations team headed by Christopher C. Kraft Jr., NASA's first flight director and later the director of the Johnson Space Center. Rose was an assistant to Kraft and chaired the meetings that drew up the Flight Operations Plans that guided Gemini and Apollo missions. Every organization involved in the conduct of each flight, including the astronaut crew, were represented at these meetings, where decisions would be made about what would happen in each flight and when it would happen. "Basically I conceived the idea that in order to get a successful mission from the operations plan, all the players needed to be aware of what everyone else was doing, and making sure that everyone was playing from the same sheet of music," Rose explained. The plans not only affected the spacecraft and its controllers, but also launch teams, the ships and aircraft on station to recover the astronauts, the ground stations, and the trainers for the astronauts and the controllers. Rose's soft voice and easy smile belied the fact that he was never afraid to stand his ground or make a point in the often contentious process of planning the Apollo flights. "I put him on my staff, and whenever I had a problem, whenever I wanted an answer, whenever I wanted anything done right, I gave it to Rod Rose," Kraft explained. "I was never a head nodder," Rose said. "If It needed to be pointed out, I'd point it out." In addition to his role in facilitating the first prayer broadcast from space, Rose was especially proud of his preparatory work on Apollo 8 because of the short time that was available to plan the historic mission after NASA leaders decided to send it to the moon. For missions like Apollo 8 and the the subsequent lunar landing missions that passed through the Van Allen radiation belts, Rose also chaired a panel of experts that ensured that the Apollo astronauts were not exposed to dangerous levels of radiation from the Sun. In the early years of the Space Shuttle program, Rose continued his work of preparing Flight Operations Plans. Because the shuttle was seen as an operational vehicle, these plans were increasingly standardized. Rose also worked on integrating the shuttle's communications and data systems, and he also represented the Flight Operations Directorate in discussions with U.S. Air Force range safety officers. Rose retired from NASA in 1984, and after working for Rockwell for five years, he and Leila retired to Wimberley in the Texas Hill Country, although they returned to the Houston area as Rose's health declined. Rose became a U.S. citizen in 1964, but he was always proud of his British heritage, and he was known as the unofficial historian of the group of engineers who came to NASA from Avro Canada. The top Canadian space story of 2013 was without a doubt Canadian astronaut Chris Hadfield's stint as commander of the International Space Station. The fact that Hadfield was the first Canadian and only the second person from outside Russia or the United States to hold the prestigious command only begins to explain his prominence over the past year. During his five months on board the ISS, Hadfield used social media such as Facebook, Twitter, Tumblr and YouTube to take earthbound humans along with him for his third voyage into space, and he used them to far greater effect than anyone who had preceded him into space. Hadfield has gained more than a million followers on Twitter, and his weightless video version of David Bowie's "Space Oddity" has been viewed more than 20 million times on YouTube. His fame has spread far beyond Canada's borders. The native of Sarnia, Ontario, returned to Earth in May and soon hung up his spacesuit. Last fall he produced his first book, An Astronaut's Guide to Life on Earth. Nine Canadians have rocketed into space, but before Hadfield, Roberta Bondar was the only Canadian astronaut who had written a book about her experiences with her 1994 book, Touching the Earth. Hadfield's book adds to the already rich body of astronaut autobiographies, most of them written by American astronauts who flew during the early human space programs of the 1960s. A few American shuttle astronauts and Russian cosmonauts have also produced autobiographies. So Hadfield set out to produce something a little different, as suggested in the title of his book and in the subtitle used in non-Canadian editions: What Going into Space Taught Me About Ingenuity, Determination and Being Prepared for Anything. The book is a relatively compact version of Hadfield's life story, organized around his views of what it took to succeed as an astronaut. The result is a captivating view of astronaut life in the two most recent decades of human space exploration. After a career in the Canadian military as a fighter pilot, Hadfield joined the Canadian astronaut team in 1992 just as the competition between the U.S. and Russia in space was giving way to cooperation, a change that would shape his career in space. In his first flight aboard the shuttle Atlantis in 1995, Hadfield was part of the second shuttle crew to dock with the Russian space station Mir. On his second flight aboard the shuttle Endeavour in 2001, Hadfield became the first Canadian to walk in space as he helped install Canadarm2 on board the International Space Station. Years of training in Canada, the U.S. and Russia to prepare for a long duration flight to the station were rewarded when Hadfield was tapped to command the ISS on Expedition 35. In common with other astronaut biographies, Hadfield recounts these highlights and takes the readers along for launches, his historic spacewalk, and re-entries. But he also talks about many of the less agreeable aspects of astronaut life, including repairing toilets, dealing with stultifying bureaucracy, and heart stopping moments when his life was in danger due to unexpected and unglamorous problems. 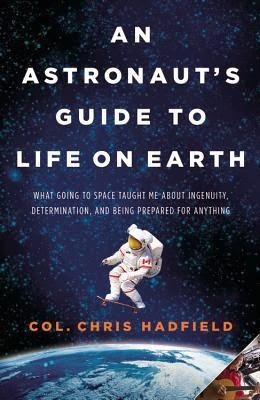 In his book, Hadfield emphasizes the importance of preparation for every eventuality, including worst case scenarios, and of "sweating the small stuff," explaining how a lack of preparation or study for even the smallest matters can put one's life in danger in high performance aircraft and in space. His points are driven home with stories from his own life, including how he nearly missed becoming a military pilot due to lack of preparation for a flight, and the time he almost lost his mission to command the ISS because of a minor medical problem. Even someone as talented as Hadfield required a huge amount of work, sacrifice and self-discipline to reach the heights of his rarefied profession. And he drives home the importance of humility, something one learns immediately upon joining the ranks of astronauts, and keeps learning, especially if one wants to have a long career in the astronaut corps. For anyone with a passing interest in space travel, An Astronaut's Guide to Life on Earth provides interesting and valuable glimpses into the lives of today's astronauts, who still face the great dangers of space despite toiling in relative obscurity. Even those who are familiar with space travel will learn from Hadfield's book, since few people who have flown in recent years have written about their experiences. His descriptions of flying to and from the ISS on the Russian Soyuz ferry craft were of particular interest to me. And how did Hadfield become a social media sensation? As he outlines in his book, much of the credit goes to his son Evan, "the communications guru in our family, savvy about the media in general and social media in particular." Hadfield produced memorable images in space with encouragement from his son, who took those photos and descriptions of life in space, and used them to produce the tweets, postings, videos and sound files, and finally, Hadfield's unforgettable version of "Space Oddity." Space travel is a team enterprise, and even Chris Hadfield's individual success was a team effort. Not a bad lesson about life.